See landscape financing options in 3 minutes without affecting your credit score. Few things enhance your home’s curb appeal more than attractive landscaping. Of course, landscaping projects can do far more than just add to the curbside aesthetics of your home—they can define your lot boundaries, create functional outdoor living spaces, and even increase the energy efficiency of your home. If you’re ready to dig into a new outdoor lawn or garden project, here’s what you should know about landscape financing solutions. What are my options for landscape financing? Landscape projects are generally viewed as good investments; well-landscaped homes tend to sell more quickly and command higher prices than comparable properties—as much as 11% or more depending on where you live and the quality of the landscaping. Did you know the American Society of Landscape Architects recommends homeowners spend about 10% of their home’s total value on landscaping? Not every homeowner is quite that ambitious, however; in 2017, most homeowners spent between just $1,500 and $5,000 on landscape projects. Most personal finance experts encourage people to save up and pay cash for nonessential home improvement projects, but the calculus is a bit different when it comes to landscape financing, since landscaping can definitely increase the value of your home. Landscape is usually viewed as less risky in terms of return on investment than a luxury upgrade such as a pool or spa. And if you’re trying to sell a home with less-than-spectacular landscaping, the right financing can get you the funds you need to complete the project quickly and land a buyer. Should you use home equity to finance a landscaping project? Landscape financing using the equity in your home is definitely an option—if you have enough equity to cover your project. These loans tend to have lower interest rates and longer terms (typically 20 to 30 years), but they can be extremely expensive to obtain. In most cases, you’ll pay an application fee, appraisal fee, loan origination fee (which may include points to lock in your interest rate), documentation fee, and any number of miscellaneous expenses that can run into thousands of dollars. You may also pay a sizable prepayment penalty if you want to pay off your loan early. Plus, home equity loans can take four to six weeks to fund, which can affect the timing and even the cost of your landscaping project. Perhaps the biggest drawback, however, is that you’re using your home as collateral for your landscape financing, which means your lender could foreclose if you don’t make your payments as agreed. Other landscape financing options may make more sense, especially if you’re looking at anything but the most expensive landscaping projects. Many homeowners prefer the idea of a personal loan for landscape financing, even if they have sufficient home equity. Zero-equity personal home improvement loans have a lot of advantages—not the least of which is that they don’t put your home at risk. 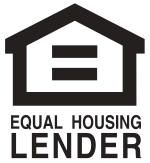 Unlike home equity loans, which usually have loan minimums of $10,000 to $25,000, personal loans have minimums as low as $1,000 to $2,000, so you can borrow only what you need for your project. Most lending partners have a loan maximum of $35,000, which is more than enough to finance even big-ticket landscaping projects like a high-tech outdoor kitchen and dining area. Although interest rates are a bit higher than with secured loans, personal loans have shorter terms, usually between three and seven years, meaning the overall cost of the loan is lower. Plus, there are no expensive upfront costs when you apply for your loan. The application process is quick and painless—and you can have your money in as little as a day or two, so you can get started on that new privacy fence right away. Monthly payments are fixed and predictable, making it simple to budget responsibly for your landscaping projects. There are also no prepayment penalties; if you decide to use your tax refund to pay off your loan ahead of schedule, you won’t be penalized. Home improvement credit cards may be your best landscape financing option for smaller projects like sodding your lawn or installing an automatic sprinkler system. 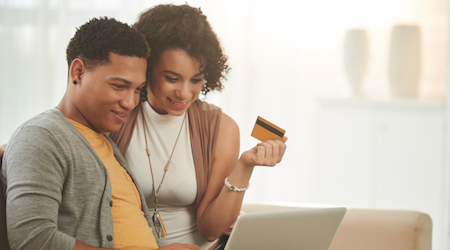 Many credit card companies offer introductory interest rates of 0% for the first 12 to 18 months, meaning you get no-cost landscape financing, provided you can pay off the balance fairly quickly. Home improvement credit cards may also be the most flexible and convenient option for your lower-ticket landscape projects. It’s easy to get “mission creep” when you’re tackling a DIY landscape project—you may decide that lovely brick patio you just installed would look so much better with a firepit and some outdoor lighting, for example. When you’re using plastic for landscape financing, you can run to the home improvement store for those extras and simply swipe your card to pay (up to your credit limit, of course). Of course, all that flexibility doesn’t mean you shouldn’t set a budget for your landscaping project upfront; it’s always a good idea to map out what you plan to spend and carefully consider any add-ons before you whip out your credit card. There’s one drawback to consider, however: Once your introductory rate expires, your interest rates can climb as high as 16% to 20%, which drives up your monthly payment and overall borrowing costs. If your landscape project runs to tens of thousands of dollars, think twice before paying with plastic. If you don’t want to wait until you’ve saved enough cash to cover your landscaping, Hearth can help you find the best rates on a personal home improvement loan or home improvement credit card. If you’re not sure which option is right for you, use our home improvement financing comparison tool to help you decide. Click to request a personal home improvement loan or home improvement credit card. The process takes less than three minutes and doesn’t affect your credit score. Review the options from our lending partners and decide which works best with your budget and landscape financing needs. Complete the application with your selected lender and wait for your money to arrive (usually between one and 10 days). Let Hearth show you how easy it is to bring your landscape projects to life with a personal home improvement loan or credit card. Having trouble picking the right home repair loan for your project? 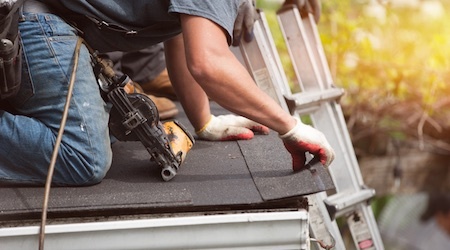 Learn which of the two common home repair loans can help you. Use our free home improvement loan calculator to estimate how much you'd pay each month with different APRs, terms, and loan amounts.